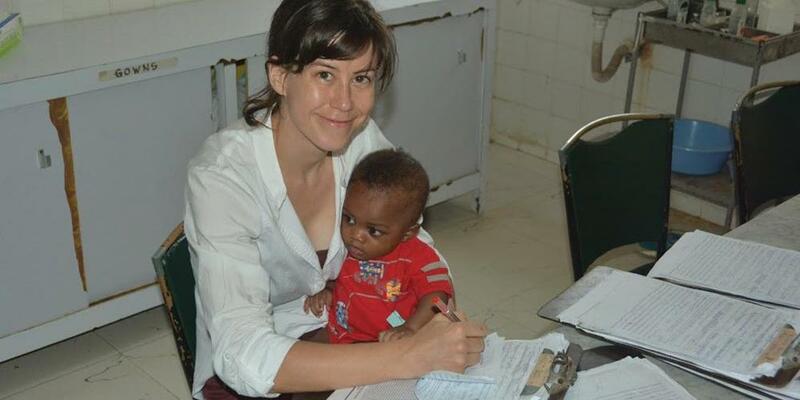 Gillian Seton, a young surgeon serving in Liberia during the outbreak of the most dreaded virus on earth. The Seventh-day Adventist Church has a rich legacy of missionaries who have ventured into dangerous territories and situations for the sake of the gospel. Putting Christ first, others second, and themselves last, they’ve served as the hands and feet of Jesus in loving and caring for those in need. One such missionary is Gillian Seton, a young surgeon serving in Liberia during the outbreak of the most dreaded virus on earth. Dr. Seton shared her chilling experience during the Church in Mission program at the General Conference session in San Antonio, Texas. She was interviewed by Dr. Richard Hart, president of the Loma Linda University Medical Center in California, where many of our medical missionaries are trained. Dr. Hart has a history of extensive support for medical mission work and founded Adventist Health International. Dr. Hart: Dr. Seton, you graduated from Loma Linda School of Medicine in 2008. After completing your general surgery training in 2013, you moved to Monrovia, Liberia, to serve at Seventh-day Adventist Cooper Hospital. What happened next? Dr. Seton: I arrived at Cooper just weeks before Ebola was definitively identified in the country of Guinea, which is about a hundred miles away. The outbreak seemed to die down for a few weeks, and we thought things would be OK. But then it escalated. One sick person at a hospital would infect five or six others, and then the staff would die and that hospital would close. One hospital after another toppled until there were only three non-Ebola hospitals left open in Monrovia to care for a population of three and a half million people. We realized that we couldn’t stand alone in this. We were desperate for supplies. Nothing was available for purchase, not even a pair of gloves. Thankfully, Loma Linda University, Adventist Health International, the General Conference, Adventist Development and Relief Agency, and some twenty other organizations came to our rescue, providing much needed medical supplies and volunteer personnel. Dr. Hart: Tell us a little about Ebola and the risks involved in treating it. Dr. Seton: The reason that Ebola is so much worse than all the other diseases that we know about is because it’s that contagious and it’s that deadly. It has up to a ninety percent mortality rate. One cc of blood from an advanced Ebola case may have between one and ten billion copies of the virus in it. No one knows how much exposure is needed to become infected. However, with such a high viral load in a small amount of fluid, only a drop in the wrong place, such as in the eye or a cut in the hand, could lead to infection. This is part of the difficulty in controlling the spread: anyone who cares for an Ebola patient is at incredibly high risk of dangerous exposure, especially in the last stages of the illness. Dr. Hart: I remember talking to you on the phone while your staff was facing a critical decision: Do we try to stay open or do we close and protect ourselves? Tell us what happened. Dr. Seton: My staff got together for several hours to discuss the risks to themselves and their families. In the end, about seventy-five percent of them agreed that we couldn’t close, that we had to do everything possible to save the lives of people with non-Ebola related emergencies. Dr. Hart: We had recently decided to make Cooper a non-Ebola hospital. There were a few centers open for Ebola treatment, but you were trying to take care of everything else in the city. Dr. Seton: Yes. People would go to four or five hospitals seeking treatment, only to learn that they were closed. Eventually, they would come to Cooper, which is off the beaten track and a smaller hospital. We had cars parked four or five rows deep and a huge crowd of people waiting to be screened and to get help for their loved ones. Dr. Hart: How did it go? Dr. Seton: I don’t like to remember those days very much. We were able to help a significant number of people, especially those with obstetric complications and children with severe malaria and anemia. Our biggest challenge was identifying those who were in the early stages of Ebola from those with other aliments because often the symptoms look exactly the same. Sometimes we were wrong; we admitted at least five confirmed Ebola cases during September 2014. Yet God protected us every step of the way. The Lord facilitated things so that we could get help—personnel, equipment, and money—just at the last minute when we were desperate for it and enabled us to do everything we could to help some of the people who needed care. Dr. Hart: We had several other missionary doctors, such as Doctors James Appel, Greg Saunders, and Greg Shank, who were willing to leave their families and assist you during this critical time. Dr. Seton: Yes, and I am so grateful for them. Not only did their presence save my life on numerous occasions, their expertise enabled Cooper to provide care for many medical emergencies. And I’m thankful for your guidance, Dr. Hart, for you advised me to serve in Liberia, and it was absolutely the best fit for me. God clearly led me there. Dr. Seton is also grateful for your prayers and donations. Your weekly mission offerings and world budget offerings help to support her ministry, Cooper Hospital, and Loma Linda University, as well as thousands of other Adventist missionaries and mission-driven institutions around the world. Their ministry wouldn’t be possible without your commitment. Thank you!